What started out as an exploration into the flexible properties of different materials soon became a revolutionary product for Boston-based industrial designer Evan Gant. His design, the Twist Light, is a pendant light that transforms to adjust the brightness with a simple twist. At the start of his design process, Gant was making prototypes simply out of paper towel rolls. 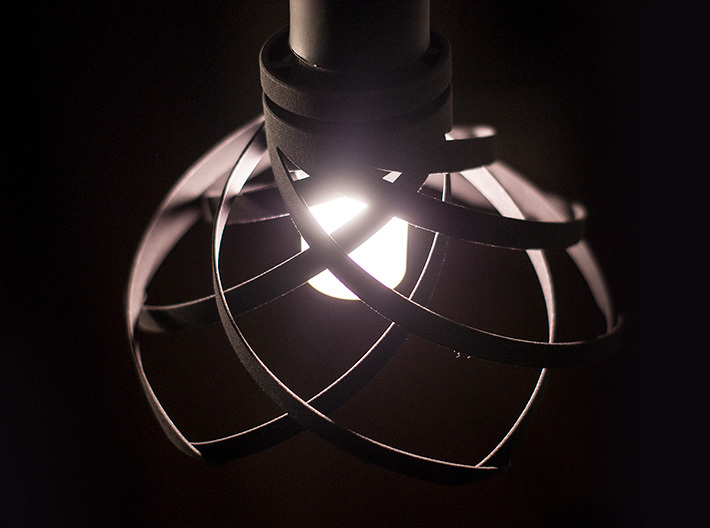 Then, seeing the product’s potential, he moved into using 3D printing to prototype the Twist Light. While using paper towel rolls was of help in the very beginning stages of the design process, Gant has now seen the many benefits to prototyping with 3D printing. In fact, he notes that using companies like Shapeways over traditional manufacturing methods — like injection molding — has proved to have many more benefits than expected. The Twist Light is now in its 4th iteration and only getting better. Gant explains the constant need for it to be dimensionally accurate, as well as for it to have good aesthetics. As he moves forward with his product, Gant is excited to see it come to fruition. He applauds Shapeways for our customer service and low costs, among other benefits. Interested in 3D Printing for Your Business? Interested in manufacturing with 3D printing? Contact us to learn about all the ways Shapeways can aid your business.